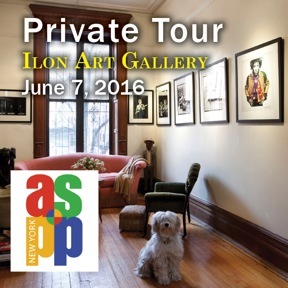 ASPP Member, Loni Efron will speak about her approach and experiences with a variety of archiving projects. In addition, she will host ASPP to a private viewing of the current exhibit at Ilon Gallery: MUSIC – a group show including many well known portrait and celebrity photographers such as Albert Watson, Annie Liebowitz, Kevin Mazur Martin Schoeller and Roxanne Lowit. In 1996, Loni Efron open one of the first archive firms in the country with two clients; Annie Leibovitz and David LaChappelle. ilon and Company specializes in archiving and editing coupled with current technology-based solutions including the iDatabase, iGallery, iMange, and iInventory. These database management solutions are tailored for photographers, galleries, collectors, agents, and large inventories and include archiving negatives, positives, prints, ephemera, and equipment. Loni will discuss her experiences in the industry and how she developed software solutions. Please join us for what will be a fun and informative evening – light snacks and refreshments will be served. Also accepting Cash at the door.